We were all heading for each other on a collision course, no matter what. Maybe some people are just meant to be in the same story. "" "
The early years are Noah's to tell; the later years are Jude's. But they each have only half the story, and if they can only find their way back to one another, they ll have a chance to remake their world. This radiant, award-winning novel from the acclaimed author of "The Sky Is Everywhere" will leave you breathless and teary and laughing often all at once. "A wild, beautiful, and profoundly moving novel. Jandy Nelson's writing is so electric, so alive, her pages practically glow in the dark." Ransom Riggs, "New York Times" bestselling author of "Miss Peregrine's Home for Peculiar Children" and "Hollow City "
"Jandy Nelson is a rare, explosive talent, and one of the best writers working today. Her prose is vivid, breathtaking, and drenched in passion, and her stories remind me why words can change the world." Tahereh Mafi, "New York Times" bestselling author of the "Shatter Me" series.
" "This is a stunning, artfully woven story. My heart burst open at the blazing, unforgettable end. Magnificent." Nova Ren Suma, author of "Imaginary Girls" and "17 & Gone"
"An extraordinary book I've never read anything like it. Lyrical-unique-passionate-magical-tragic-hopeful Nelson's characters will fly off the page and into your heart." Nancy Garden, author of "Annie on my Mind"
Jandy Nelson, like her characters in" I ll Give you the Sun," comes from a superstitious lot. She was tutored from a young age in the art of the four-leaf clover hunt; she knocks wood, throws salt, and carries charms in her pockets. Her debut novel, " The Sky Is Everywhere," was on multiple Best Books of the Year lists, was a YALSA Best Fiction for Young Adults pick, earned numerous starred reviews, has been translated widely, and continues to enjoy great international success. 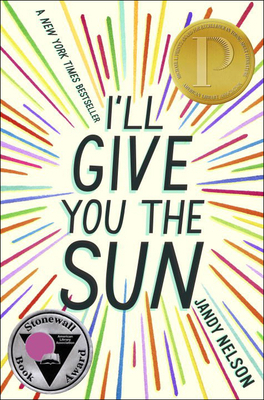 Currently a full-time writer, Jandy lives and writes in San Francisco, California not far from the settings of "The Sky Is Everywhere" and" I ll Give You the Sun.""